Vietnamese? Absolutely. French? We’re there. 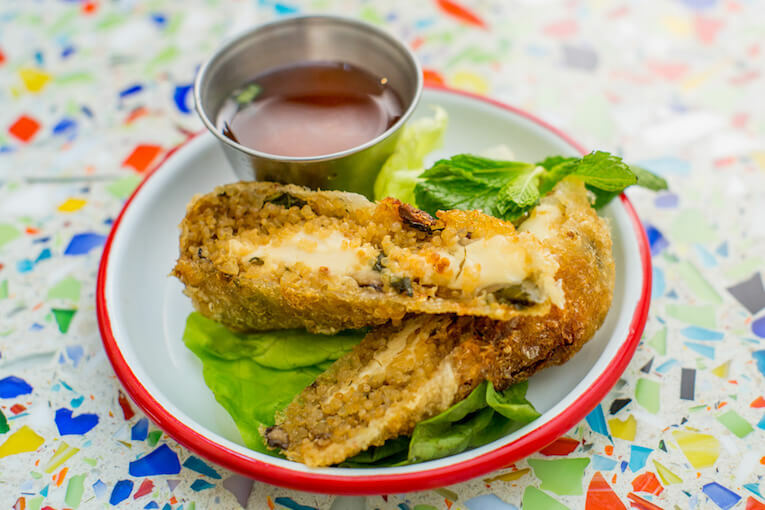 Vietnamese and French fusion? Now that’s something worth talking about. BòCàPhê is here to offer the best of both worlds, and we’re completely here for it. 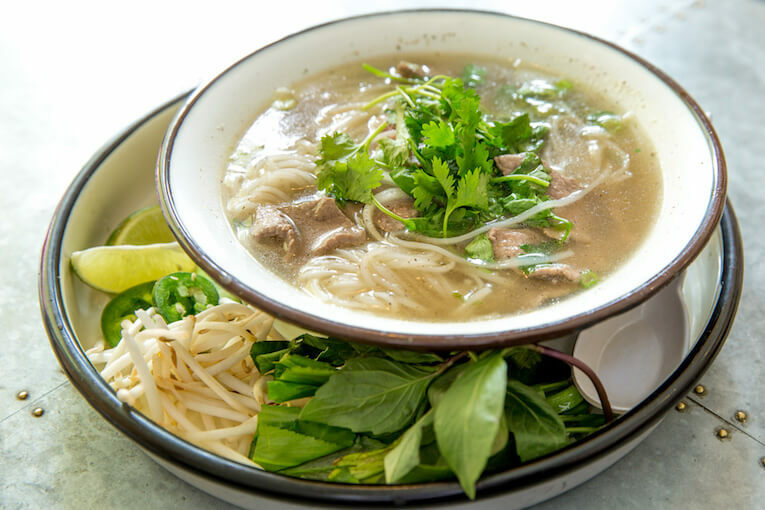 BòCàPhê seeks to provide the best healthy Vietnamese food with a French twist, and selfishly, I needed to check it out because both cuisines are two of my favorites. My guest and I showed up to the Lower Manhattan restaurant, giddy, and immediately noticed an upscale diner vibe with a long bar and casual table seating. There were industrial elements juxtaposed with graphic wallpaper and old-time photos. Hanging plants and assorted colored lights dangled from the exposed beams and a neon pink zig zaggy light lined the side of the bar. Our host directed us to the exciting cocktail menu, which featured inventive craft drinks with lots of personality. I opted for the Ho Chi Mint ($13), made with sake, ginger, lemon juice, pineapple and mint, while my guest went with the Back to Black ($13), which featured sake, lemon, honey, lavender and black charcoal. The Ho Chi Mint was fresh and fruity but not too sweet while the Back to Black was soft and floral, with flavors like lemon and honey opening themselves up one after another. The food menu is just as unique and tantalizing, and we genuinely needed help choosing. Our host pointed us in the direction of the taro fries ($7), chicken spring rolls ($4.50 each) and the shishito peppers ($8) to start. The taro fries came out piping hot, but were crispy and savory (and baked!). The spring rolls were rich, flavorful, juicy and crunchy while the peppers were bursting with fresh flavor. We could barely contain ourselves by the time we chose our mains. I chose the classic pho ($16) while my guest went with the beef truffle and shiitake rice bowl ($19). The pho was rich and deep, and you could tell it was slow-simmered for hours. The rice bowl was flavor-packed with peanut sauce and fork-tender beef, sprigs of cilantro and fluffed rice. We were basically taken on a rollercoaster of flavors between the appetizers and our mains, and if dessert were an option, we were fine without it. To be honest, I came for the pho, and it exceeded my expectations a hundred times over. All I can say is that I plan to spend more time in Lower Manhattan, thanks to BòCàPhê.